An imposing living room in its size and full of space, with a high ceiling. How can I furnish this room, making the most of its large spaces? I need a few ideas. This is a brief summary of some questions that some of you will be asking yourselves right now. Perhaps you are in the middle of furnishing your living room and you do not know how to make the most of it. 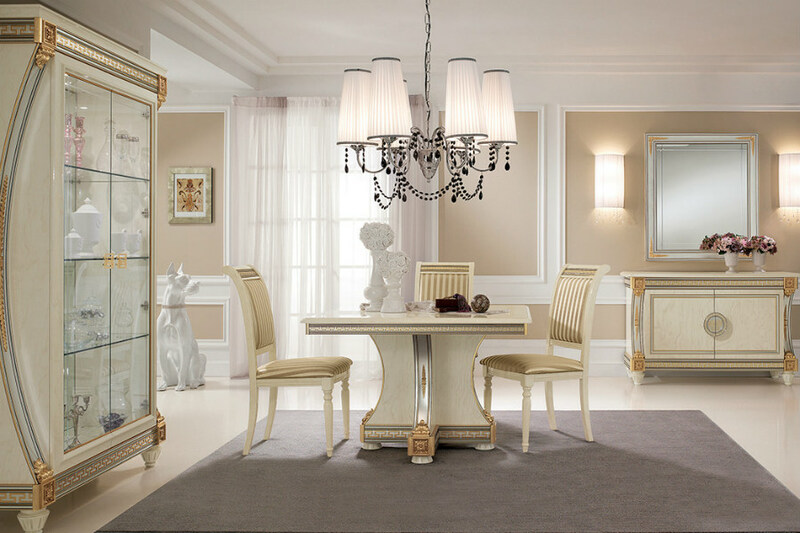 Do not far, by choosing the impeccable classic taste of made in Italy furniture, you will find creative ideas for decorating the living area of your home. In this article, we will show you the many furnishing possibilities that a living room with a high ceiling can have. The space available in height should be optimised and exploited suitably, in order to find one or more solutions that can lend more luxury and exclusivity to this room in the house. Faced with such a rich opportunity for personalisation, let’s see how to furnish a living room with high ceilings with elegant ideas that can satisfy the criteria of practicality, please the eye and can attract the gaze of those who live in it every day. Suggestions that you can also combine together to obtain an overall effect that will leave its mark. Art is the purest, most noble human creative activity, and any home without type of art loses value and beauty. Of course there are subjective preferences of taste in style and type, but the greatness of a work of art is always objective, as it always knows how to be current in its language and form. This is perhaps the most immediate response to the question of how to furnish a living room with high ceilings, but not necessarily banal or predictable. Reducing the height of the ceiling using artistic elements is considerably helpful: it does not only fill the space vertically, filling any sensation of emptiness on the walls, but also lends aesthetic value to the whole room and livens up the entire concept of furnishing. It is not necessary to create an art gallery, covering every part of the wall. For an elegant result it takes balance and moderation. There are many possibilities: from paintings to sculptures, from tapestries to low relief works. Each of these represents a valid opportunity for improving the appearance of your living room exploiting its height. This phrase may sound misleading, but it is a simple trick which only requires the point where the curtains are attached to be moved higher up. Hanging long curtains from the ceiling is an apparently unusual solution, but is highly effective that will highlight the quality and finery of the fabrics you have chosen for the drapes extending both visual and spatial capacity, without making them bulky within the living room space. They only develop vertically, in fact. Leave any architectural finishes intact, not changing their original beauty. Do not change the appearance of the ceiling, but take ideas from its size, it architectural details that help to make the entire living room a majestic, unique and inimitable space. Choose a design element that can fully adapt to the huge space around it, embellishing it in every part. One of the most particular suggestions on how to furnish a living with high ceilings, we can find a wide choice from the fine lighting solutions. Our advice is to use a large lighting fixture that acts as a "visual connection” between the ceiling and the area below. In order to do this, the lighting fixture needs a personality of its own and must be able to enhance the way the entire room is furnished with its light. Given the luxurious, sought- after image of the room, it becomes almost inevitable that models embellished with precious details are taken into consideration. You could opt for a lighting fixture with crystal pendants, like one of the models from the “Donatello Collection”, full of flowers and extremely ornamental decorations. Or you may be interested in the cleaner lines of a “Tiziano” light”: transparent and white, a pure, ethereal light source. Tall shelves and items of furniture, like a bookcase for example, are excellent solutions for completing the furnishing of a living room with high ceilings, as they are a universally appreciated answer. Taking up only a minimal amount of room, they fill walls and dress them with a regal feel. You could fix shelves to the walls and personalise them in height, number and position, depending on how you prefer them. 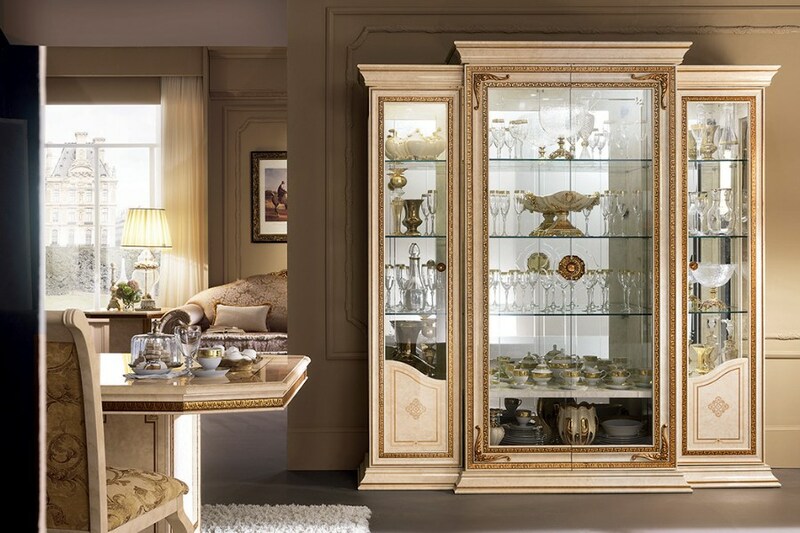 If you are looking for more sophisticated decorative furnishings you could choose glass display cabinets, which are structurally lighter in appearance. Filled with silver and glassware, they lend a richer, elegant appearance to the living room, like a treasure chest full of jewels. 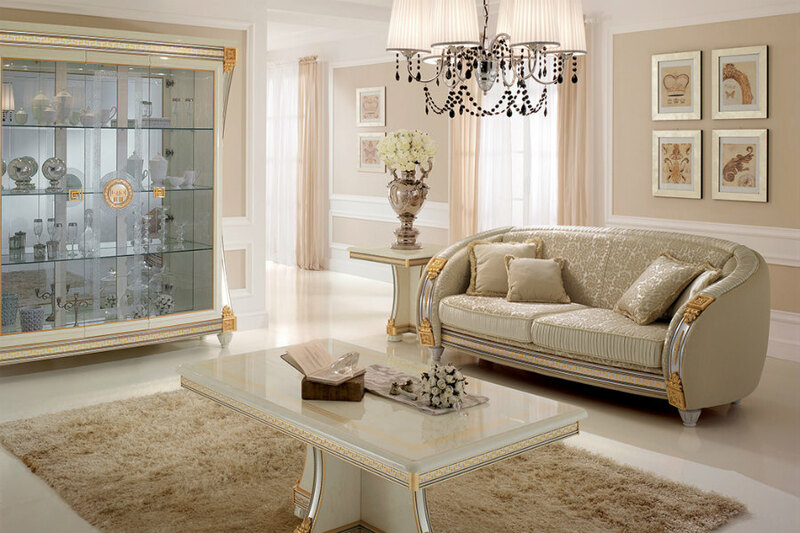 One item of timeless classic magnificence and elegance is the “Liberty glass cabinet” a classy item of furniture almost entirely made of glass. Lightness and brightness merge and give light to a wonderful item that it is difficult to take your eyes off. 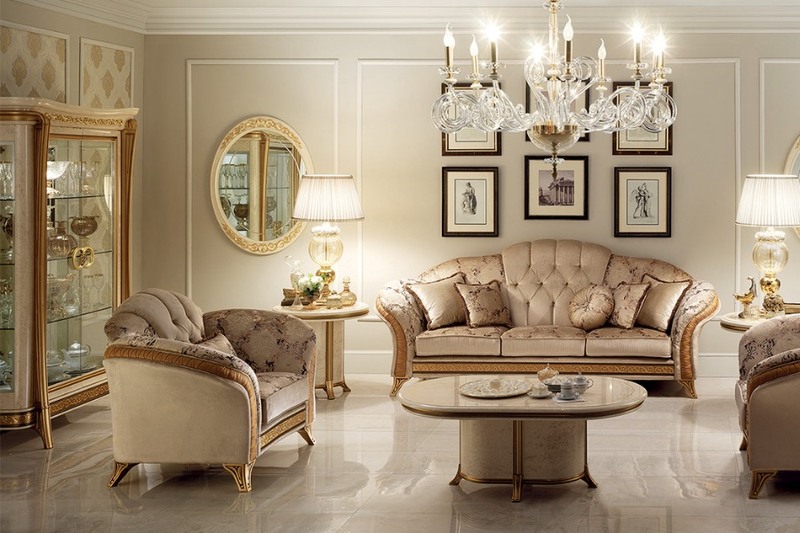 Thanks to the taste and class of Italian furniture, we will lend a prestigious, refined appearance to your living room. 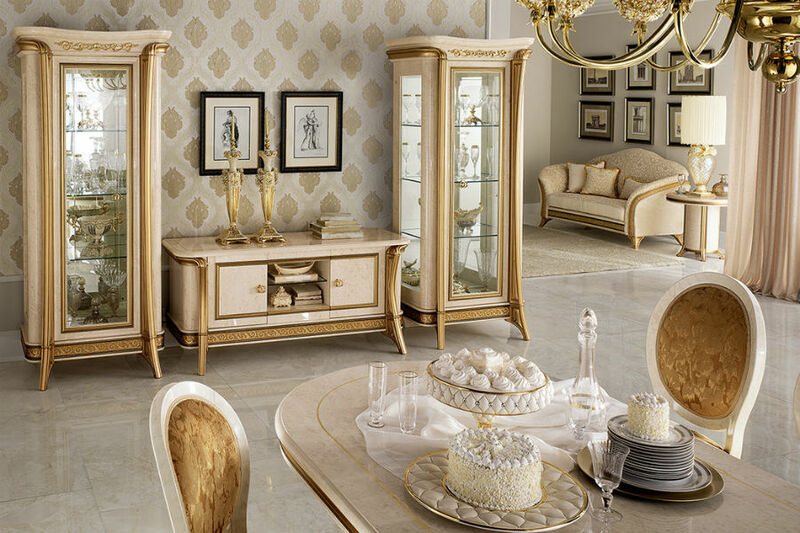 Classic style does not furnish; it embellishes, communicates and excites. Follow our suggestions for furnishing your living room and see which accessories you prefer that can create a luxury atmosphere in your living room.